Anil Verma Associates, as Campus Project Manager, specifically provided Construction Management for this $90-million Design-build project, including preparation of Request for Proposal, Design-builder selection and award, and issuance of Notice to Proceed with design on November 15, 2012. AVA managed the Design-build process through design milestone submittals through agency approval with specialty service design consultants, including technical and constructability reviews and managing the construction through site work and completion of building structures, including relocation and closeout. 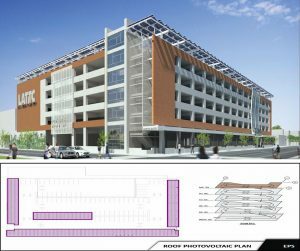 The EPS is 1,000 stall 6-story parking structure net zero energy building with storage on a 1.4 acre urban site. By its material palette, it visually connects with construction technology building and new campus building across a major street. Car counting system provided with no parking on ramps.